When I setup the graphic on this final prototype, I made a mistake and switched the speed/depth labels with the starve/volume labels. 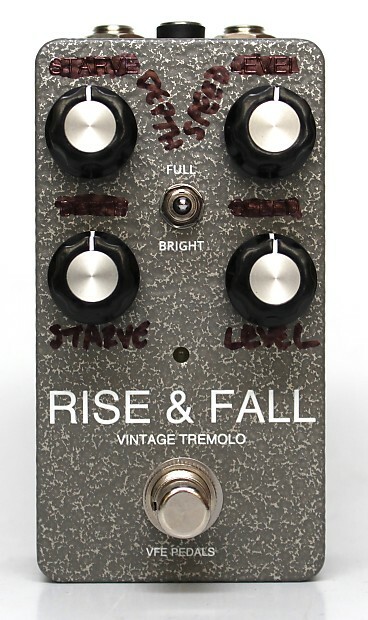 I used a marker to relabel the prototype, which has the same circuit and tone as the rest of the batch of Rise & Fall pedals I built this summer. I built a batch of Rise & Fall vintage tremolos as I worked this summer with a student on a new process of making hand-painted graphic. The surface of these pedals is a little rough, but they look & sound great. I modded the original Rise & Fall by adding a voicing switch, from full range to bright. It works great with the starve knob to add natural grit or full blown starved-transistor distortion. FULL/BRIGHT - toggles between a full vintage tremolo tone and one where the peaks are brighter than the valleys. It can add sparkle & presence, or simply remove some low end mud introduced by the tremolo effect. Works with 9-18V DC power supply (not included). FREE SHIPPING via USPS Priority inside the USA, $15 to Canada & $20 everywhere else with USPS 1st Class Mail (insured). 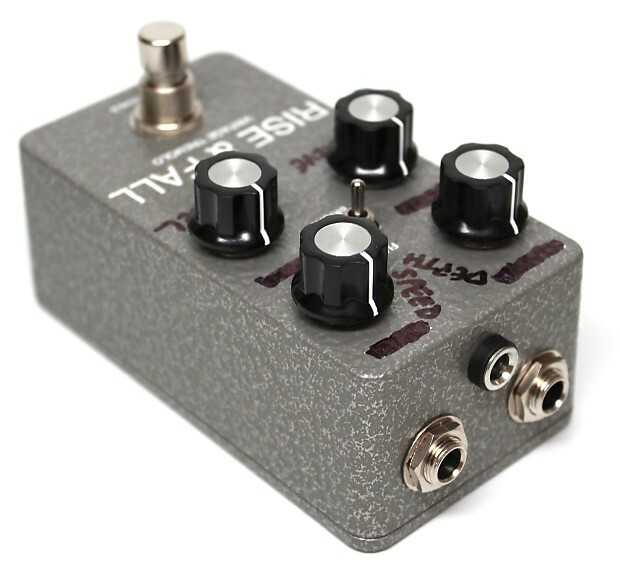 The buyer can return the pedal in the first 14 days for a full refund. All VFE Pedals include a 1-year warranty on parts & labor. Most orders are shipped within 2 business days of payment received. You will be notified if any order will take longer. Buyers have 14-days to return any products for a full refund, minus any shipping charges (buyer pays for return shipping). VFE Pedals has a standard 14-day, no-risk return policy. Send it back within 14 days of receipt of your order, and we'll issue a full refund. Our 1-year warranty covers parts, warranty, and shipping back to you.